A given individual bacteria has to compete and interact with multiple factors outside the cell which means communication is an important factor. Most of the molecules that are involved in such a process is a macromolecule protein (such as toxins and sensor molecules). The release of these molecules is subject to tight regulation. As already known, a bacterial cell structure is very highly organised with multiple layers. The cell envelope of Gram negative bacteria is composed of two membrane layers and a periplasmic space in between, whereas the envelope of Gram-positive bacteria consists of a cytoplasmic membrane followed by a very thick peptidoglycan layer. The transport of molecules within such intact cellular structure is managed by specialised machinery called as secretion systems. The secretion system spans across the cell wall from the inner membrane to outer membrane. Currently, 7 types of secretion systems have been defined, each labelled as Type I- Type VII. For purpose of simplicity remember that T1SS (Type 1 secretion system) to T6SS is seen in Gram negative bacteria (which is further classified into Sec-dependent and Sec-independent) and T7SS is seen in Gram positive bacteria. 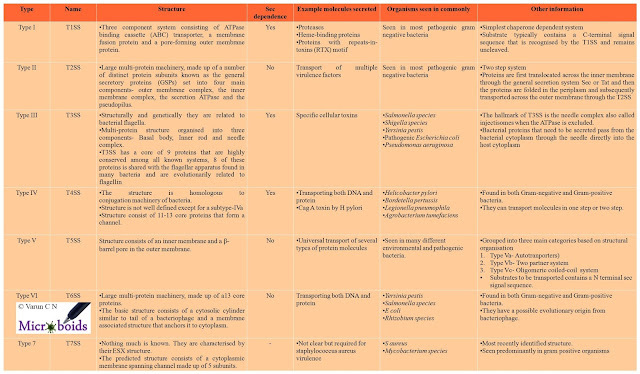 Bacterial secretion systems are highly diverse and each type has multiple subtypes which vary by its structural and regulatory details. An individual bacterial species can have more than one type of system for accomplishing multiple roles. In an old post on Toll-like receptors, I used the concept that instead of writing pages and pages of data I summarised it all into one single table, so it becomes easy to learn. I'm doing the same here. 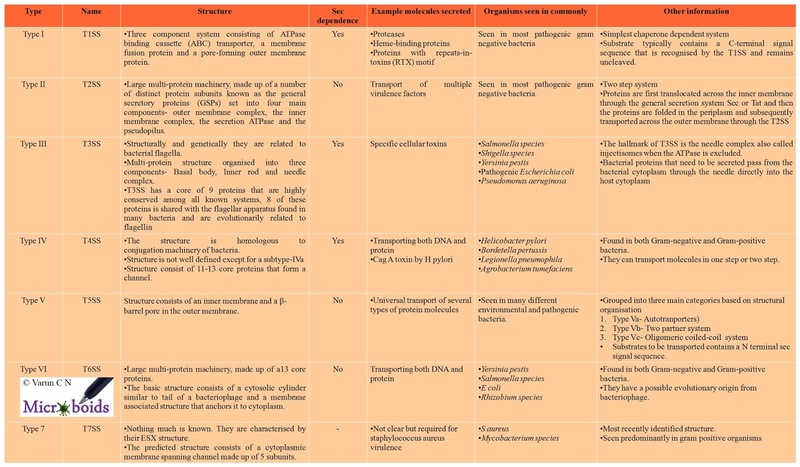 Table 1: Bacterial secretion system. A long time ago, I had talked about the vector control program that can be used to intervene with mosquito vectored infectious disease. Perhaps there is no another species group that we hate so much than the mosquito. Of them, Aedes aegypti is responsible for several thousand infections a year globally since they aid in the transmission of Yellow fever virus, Dengue virus, Zika Virus etc. Biological vector control is a tricky business and not everyone understands what Oxitec is trying to do with genetically modified mosquitoes (GMM). 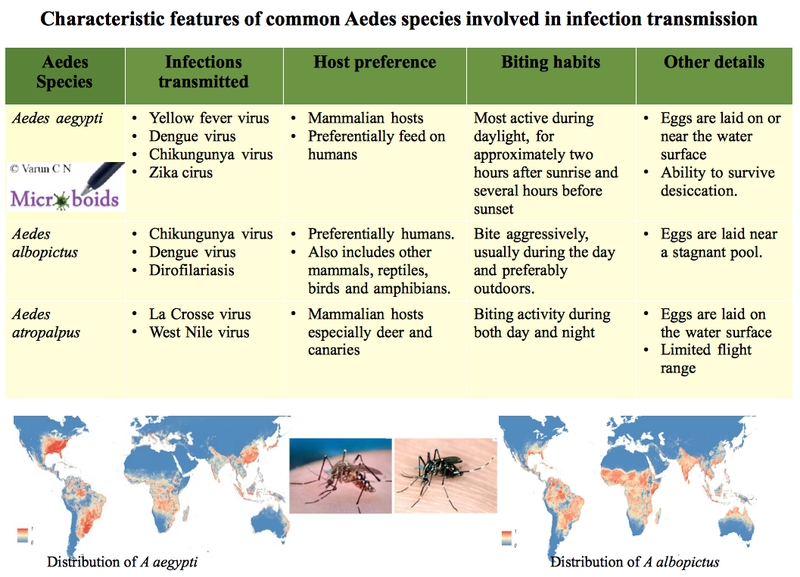 Aedes aegypti is a holometabolous insect with 4 stages in life cycle including egg, larvae, pupae, and adult stage. Their life cycle happens in 2 phases- aquatic phase (larvae, pupae) and a terrestrial phase (eggs, adults). The number of days required for life cycle ranges depending on the environmental condition and roughly ranges from 10- 21 days. Mosquito survives on feeding on plant materials and blood is required only by the female. The female produces nearly 100 to 200 eggs per batch (Maximum of five batches of eggs during a lifetime). The number of eggs dependent on the size of the blood meal. A rough calculation is that for every mg of human blood about 40 eggs can be laid (the protein for building the egg comes from blood digest). Modified mosquitoes is not an entirely new phenomenon. 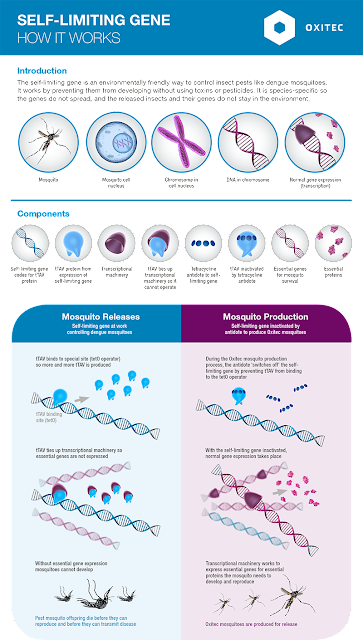 Other than the Oxitec genetic modification approach, use of Wolbachia has been a popular approach tried by others such as MosquitoMate and EliminateDengue. What has Oxitec done differently? They have engineered a strain of male aedes aegypti mosquitoes code named OX513A. It basically contains a genetic insert of a gene called tTAV. 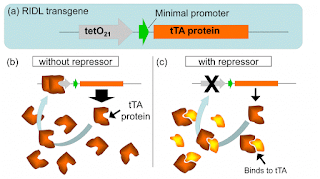 The expression of tTAV protein is transcriptionally controlled using tetracycline antibiotic. In the presence of the antibiotic, essential proteins for development of mosquito are made available and hence an offspring can be formed. 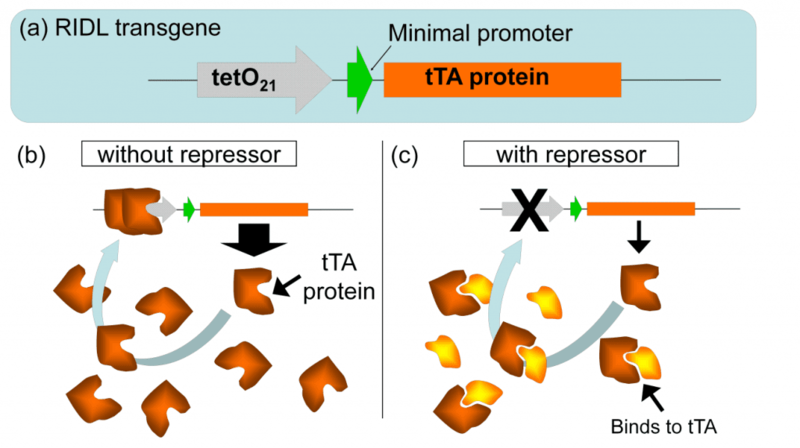 However in wild lack of this control leads to inability to express the essential proteins and hence offsprings are not formed which is passed from the genes in sterile male. For all other reasons, such a genetic sterile male is fit and can compete with wild males thus effectively reducing the population. See Fig 1 for overall details. A couple of quick clarifications here. Males don't bite for blood and hence such a release doesn't increase any infection transmission. The males are sorted from the females in its pupal stage which has a greater than 99.9% sorting efficiency. Considering that 1000's of mosquito has to be released thrice a week, a few females may be released, but the statistics are highly insignificant. The released mosquito is viable for about a week. Approximately 70 million mosquitoes have been released to date without any negative impact being reported. The next real question why tetracycline gene? The answer is tetracycline is a compound that is not widely found in the environment. It is estimated that nearly 2000-3000 times more concentration of tetracycline is required in the environment to enable rescue of the phenotype. Trials in Brazil, Panama and the Cayman Islands, shows releases of Oxitec’s mosquitoes reduces the wild population of Aedes aegypti by more than 90%. The tight target which is highly species-specific is superior to insecticides, which has been already tried. In India, Oxitec is working with Gangabishan Bhikulal Investment and Trading Limited (GBIT) and preliminary evaluation was done against A aegypti local strains from Delhi and Aurangabad. I'm not able to gather if a further trial has been conducted, but I gather that permission is being sought from the Review Committee for Genetic Manipulation (RCGM) for contained laboratory based studies in October 2013. The tech definitely is promising and many parts of the world inc WHO is looking to implement this program. There is some resistance to release of mosquito by public especially since the technology is not clearly undertood and some fear that releasing more mosquito is a danger. 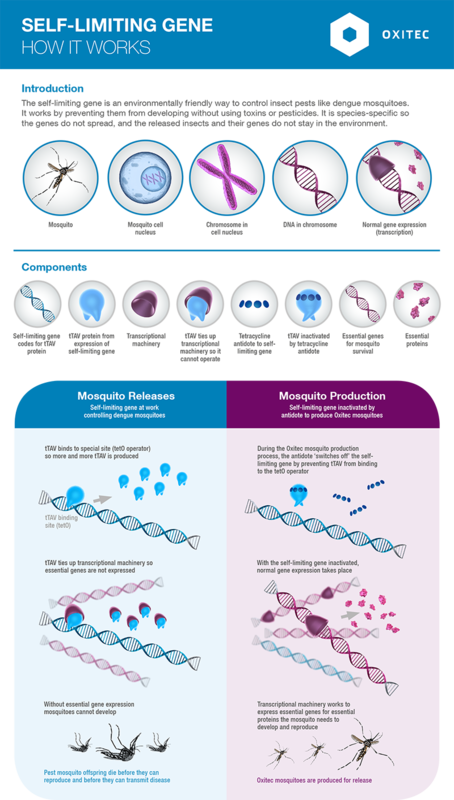 But it is really interesting to see that mosquito can be used to combat mosquito population, something that is really needed at this time for combating vectored infections. 2. Patil et al. (2014). Mating competitiveness and life-table comparisons between transgenic and Indian wild-type Aedes aegypti L. Pest Management Science, DOI 10.1002/ps.3873.